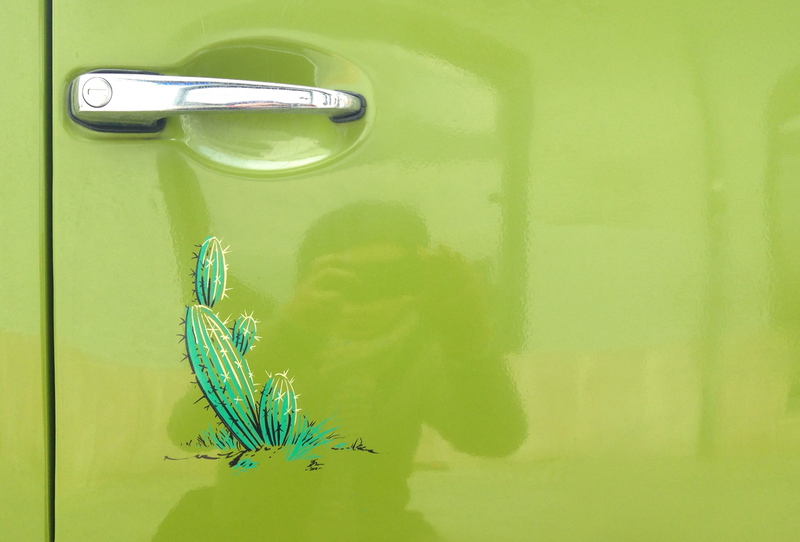 A prickly little hand-painted cactus, its spines sticking out like sparkles, graces a V3 Volkswagen van often parked near my studio. Shiny and apple green, clearly maintained with love, the van makes me want to go a-wandering down country roads on a slow, meandering road trip. This small urban plant on the passenger-side door, hinting at desert driving adventures, just makes it all the more evocative. Seen any plants decorating your neighborhood vehicles lately? This laid-back cactus must have an interesting life. 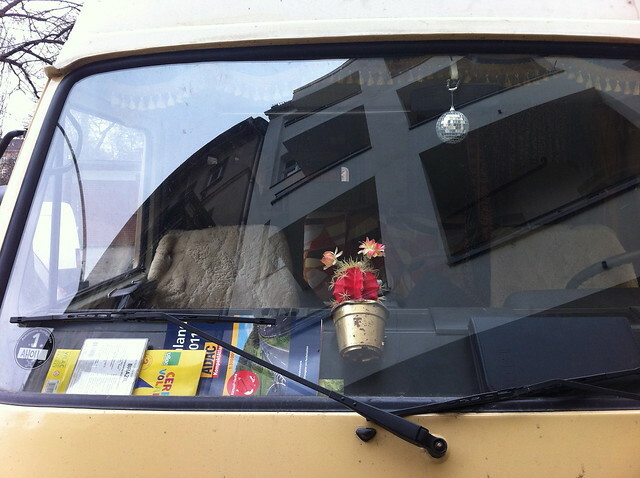 A glam little character with its bright red color and gold spray-painted pot, chilling under a disco ball, it lives on the dashboard of a van that clearly goes places. Well stocked with maps and music, this little guy is living the dream. Spotted recently at Boxhagener Platz in Berlin-Friedrichshain. Once in awhile, in addition to 3d, living plants, I document depictions of plants, too. 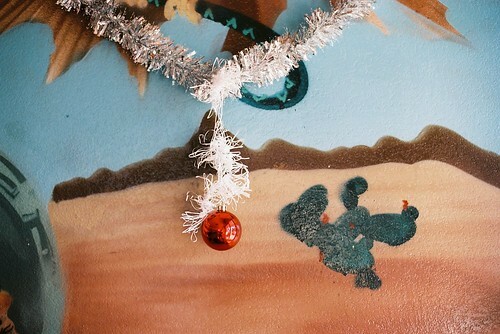 After eating some fantastic tacos in Santa Cruz early last month, I noticed a blobby little urban mural cactus hiding behind the Christmas decor. 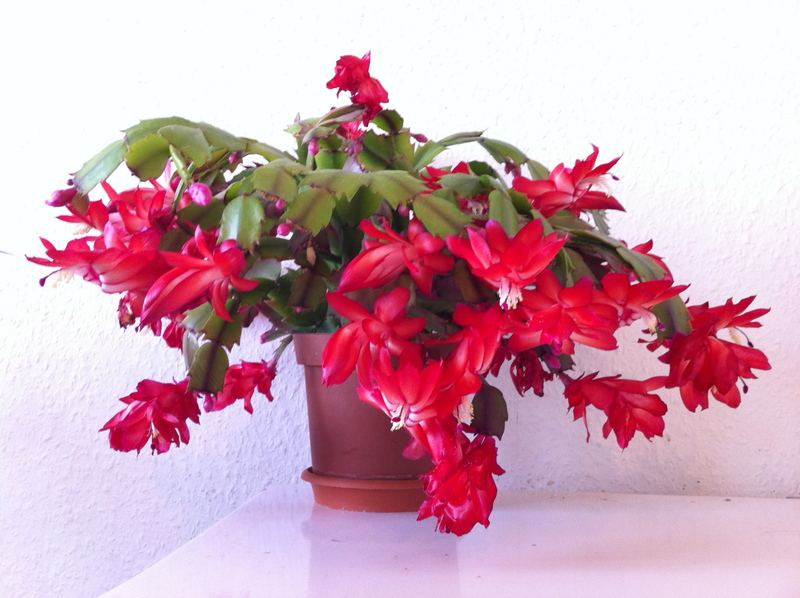 If you are a person of patience, or need a reminder that time is cyclical, get a Christmas cactus. Like most flowering plants, it blooms but once a year. But how it blooms! In contrast to its usual compact, green, nondescript form, my plant dons so many bodacious red blossoms each December that it literally doubles in size. Thank you to Oma Uschi for giving us this plant four years ago. As you can see from this recent photo, it’s still going strong. What about you, readers? Any of you have winter-blooming plants in your lives?